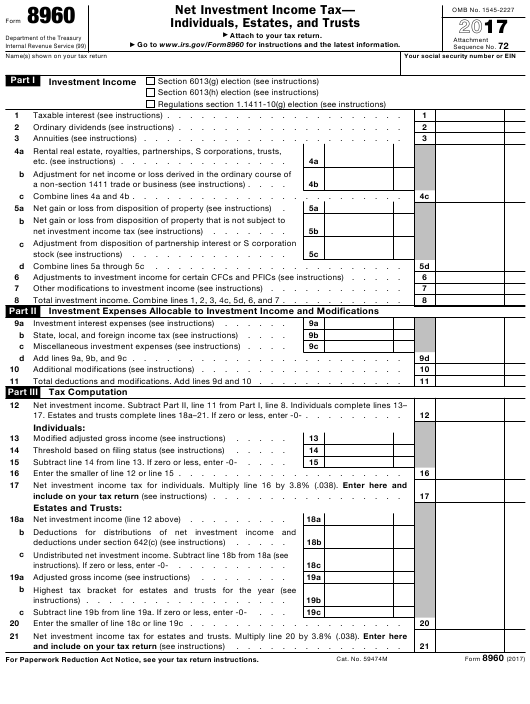 IRS Form 8960 or the "Net Investment Income Tax Individuals, Estates, And Trusts" is a form issued by the U.S. Department of the Treasury - Internal Revenue Service. Download a PDF version of the latest IRS Form 8960 down below or find it on the U.S. Department of the Treasury - Internal Revenue Service Forms website. Go to www.irs.gov/Form8960 for instructions and the latest information. Taxable interest (see instructions) . Ordinary dividends (see instructions) . a non-section 1411 trade or business (see instructions) . c Combine lines 4a and 4b . Adjustments to investment income for certain CFCs and PFICs (see instructions) . Other modifications to investment income (see instructions) . Total investment income. Combine lines 1, 2, 3, 4c, 5d, 6, and 7 .
c Miscellaneous investment expenses (see instructions) . d Add lines 9a, 9b, and 9c . Additional modifications (see instructions) . Total deductions and modifications. Add lines 9d and 10 . 17. Estates and trusts complete lines 18a–21. If zero or less, enter -0- . Enter the smaller of line 12 or line 15 .
include on your tax return (see instructions) . Enter the smaller of line 18c or line 19c .